It’s one thing to come and do a concert during the South Florida season, but it rises to another level when you’re able to bring your friends. 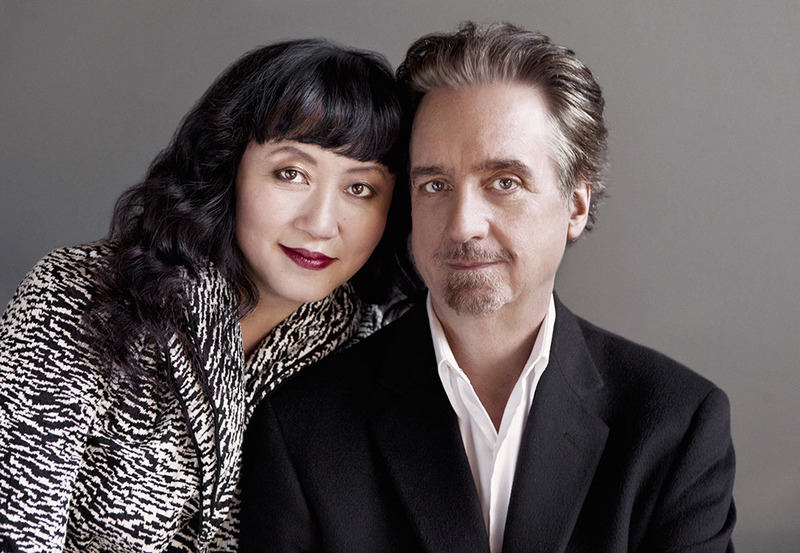 This month at the Society of the Four Arts in Palm Beach, the proprietors of New York’s Chamber Music Society of Lincoln Center, the husband-and-wife team of cellist David Finckel and pianist Wu Han, will settle in for a week of concerts and lectures centered around music from the Romantic era. The series will include three concerts featuring Finckel and Wu Han as well as eminent musicians from the Lincoln Center roster and one of Finckel’s former colleagues in the Emerson String Quartet. Also included will be lectures about the music and an open rehearsal, activities well-suited for the quasi-liberal arts college that is the Society of the Four Arts. “The designing of a festival is very different than just playing a single concert,” Finckel said last month over the phone from his home in New York. “You hope in advance that people will look at an opportunity like this and allocate the time. That’s the thing that festivals do: People say, ‘I’m going to take my vacation and I’m going to the Lucerne Festival.’ Or ‘I’m going to go to Tanglewood.’ It’s a commitment of a chunk of your life for something that is arguably on a higher level of experience than one gets every day. Finckel, 67, was the cellist for the Emerson String Quartet, often considered the finest of all American string quartets, for 34 years before stepping down in 2013 and ceding his chair to cellist Paul Watkins (the quartet’s original violist was Guillermo Figueroa, now leader of the orchestral program at Lynn University). Finckel and Wu Han, who is 59, have made substantial contributions to music and music education in the past two decades as performers, entrepreneurs and presenters. The two founded a label called ArtistLed in 1998, now based in Ardsley, N.Y., which in November released its 20th recording, a disc of cello sonatas by Bach, Mendelssohn, Debussy and Britten. In 2003, Finckel and Wu Han created Music@Menlo, a summer chamber music festival in Atherton, Calif., that lasts three weeks and is built around a programming theme; the organizing principle of last year’s festival, for example, was Creative Capitals. Replicating a Lincoln Center-style week of concerts and lectures for Palm Beach came from the Four Arts, Finckel said. The Society wanted to “do something on a larger scale and more comprehensive than just a single concert,” he said. “I’ve only ever played a single concert there, and I loved it. I loved the venue. But it was their idea to try to do something that taps into things that Wu Han and I do a lot of the time. The theme of the residency, which will run from Sunday through Feb. 17, is the evolution of the Romantic musical style in the first half of the 19th century, covering music from early Beethoven to middle-period Brahms. A particular focus will be the music of Franz Schubert, who will be represented by one of his late piano trios and the Trout Quintet, a popular and cheerful chamber work based on The Trout (Die Forelle), one of Schubert’s 600 songs. “This ‘Romantic Evolution’ idea … which traces music from vibrant early Beethoven to Schubert all the way to Brahms, that’s a very logical period of musical evolution. There are certainly others one could focus on … this one seemed to emerge as a favorite amongst us all,” Finckel said. To put this all in context, the residency will draw on the talents of Patrick Castillo, a composer and radio host for WQXR-FM in New York City, who will give a lecture called “Romantic Evolution” that will take an in-depth look at the music of the three concerts the festival is presenting. The residency will consist of eight events, three of which are concerts. On Sunday afternoon, Finckel and Wu Han will perform works by Beethoven (Sonata No. 3 in A, Op. 69), Mendelssohn (Sonata No. 2 in D, Op. 58) and Brahms (Sonata No. 1 in E minor, Op. 38). Also scheduled is Schumann’s Adagio and Allegro (Op. 70), originally for horn and piano but played here in a version for cello and piano. The second concert, set for the evening of Wednesday, Feb. 13, is billed as a Chamber Music Society of Lincoln Center performance, in which Finckel and Wu Han will be joined by the French violinist Arnaud Sussman and the American violist Paul Neubauer for the Brahms Piano Quartet No. 1 (in G minor, Op. 25), much beloved for its frenetic “Gypsy” finale. Finckel will perform the Schubert Arpeggione Sonata, and the three string players will team up for the String Trio No. 3 (in C minor, Op. 9, No. 3) of Beethoven. The closing concert, on the afternoon of Sunday, Feb. 17, is an all-Schubert program featuring the rising bassist Xavier Foley along with Neubauer and violinist Philip Setzer in the Trout Quintet. Finckel, Setzer and Wu Han will also play the massive Piano Trio No. 2 (in E-flat, Op. 100), and baritone Edward Nelson will appear as a special guest singing two songs: Die Forelle, and also the Swedish folksong Se sollen junker, which Schubert borrowed for the slow movement of the Op. 100 trio. “We’ve never done these three concerts in succession before. We’ve explored Romanticism, we’ve explored Schubert, we’ve explored Brahms, we’ve explored Beethoven. But this is a custom design for Four Arts,” he said. “But it comes together from our having programmed all of these composers within the context of their own music and also within the context of the stylistic period in which they lived, and how they managed to innovate and transform music itself during their lifetimes. “Our projects in the past have certainly given us the background to know where to come from with these things, but for this particular project and this week, it’s specifically made for Palm Beach and the Four Arts,” he said. In addition to Castillo’s lecture on Monday, Wu Han will give a talk that morning called “Chamber Music 101,” and on Friday there will be a private rehearsal for the Schubert concert, followed by a panel discussion with the musicians. A private reception with the players for package ticket holders follows. The whole series costs $100 for members, $200 for non-members. Finckel said he’s not looking for anyone who attends one of the concerts or the whole series to be an expert in Romantic music or to hope that they become one. It’s enough just to enjoy the performances, talks and rehearsal, but without any dumbing-down gimmicks to draw more people in. “I think a lot of damage has been done to classical music by people who’ve thought that by compromising the quality of the performance, the setting, the venue, anything that somehow they’re going to lure in a younger audience or a more diverse audience, or whatever. I have yet to see that work,” he said. “What I know works, from our festival in California and at Lincoln Center, is doing exactly what we do. Presenting the music for what it is at the highest quality performance and production that we can possibly imagine, and letting the music speak for itself, and letting our musicians play their hearts out unencumbered and unconcerned with anything extraneous other than giving the best performance. All events are at the Gubelmann Auditorium, Society of the Four Arts, Palm Beach. Tickets: $100 for members, $200 for non-members. Call 561-805-8562 or visit www.fourarts.org. Feb. 10, 3 p.m.: Recital, David Finckel and Wu Han. Feb. 11, 11 a.m.: Chamber Music 101, talk by Wu Han. 2:30 p.m.: Romantic Evolution, lecture by Patrick Castillo. Feb. 13, 7:30 p.m.: Concert, David Finckel, Wu Han, Arnaud Sussman, Paul Neubauer. 4-6 p.m.: Private reception with musicians. Feb. 17, 3 p.m.: Concert, David Finckel, Wu Han, Philip Setzer, Paul Neubauer, Xavier Foley, Edward Nelson.